The Battle of Nassau (March 2 – March 3, 1776) was a naval action and amphibious assault by American forces against British-occupied Nassau in the Bahamas during the American Revolutionary War. It is considered the first cruise and one of the first engagements of the newly established Continental Navy and the Continental Marines, the progenitor of the United States Navy and Marine Corps. The action was also the Marines' first amphibious landing in United States' history. It is sometimes known as the Raid of Nassau. USS Nassau (LHA 4) is named for the Battle of Nassau, the Navy/Marine Corps team's first-ever amphibious landing. Capt. 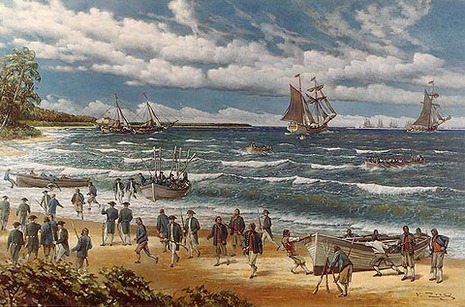 Esek Hopkins of Rhode Island rallied a task force of four ships near the Bahamas on March 1, 1776. The next day Hopkins sent a raiding party of 230 Marines and 50 Sailors ashore under the command of Capt. Samuel Nicholas, the Continental Marines' first commissioned officer. On March 3 the Marines captured Nassau without a fight and seized a sizable store of cannon, mortars and munitions. The battle marked the first time American Sailors and Marines responded to the command "Land the landing force."